Established in 2012, LATAM Airlines Group is the holding company resulting from the merger of LAN and TAM airlines, the largest carriers of Chile and Brazil, respectively and, combined, the biggest carrier in Latin America with a fleet of 300 aircraft and 53,000 employees. Having operated as separate airlines since the merger, LATAM introduced a new logo last week that will take over the existing LAN and TAM brands and will unify all livery by 2016. The logo has been designed by the Sao Paulo, Santiago, and Madrid offices of Interbrand. A reconciliation strategy was drawn, connecting the best of two worlds. Having explored several alternative names; “LATAM” proved to be the name that best represents the brand’s new spirit. Formed by a hybrid of “LAN” and “TAM”, the name respects both companies’ roots and recognises their successful legacies within the new brand. Used as an abbreviation for “Latin America”, LATAM is a name that precisely illustrates the company’s new identity. The lines in the new logo are inspired by a figurative representation of the continent’s own geography. Coral and Indigo are the brand’s new main colours. Indigo is the result of the intersection of red and blue — colours of TAM and LAN, respectively — and symbolises LATAM’s efficiency and elegance. Coral represents the brand’s passion and care for their customers. These central colours are complemented by a secondary palette, to evoke the continent’s diversity. The symbol’s design connects with the logo’s proprietary typography and the letters combine both straight and rounded corners, bringing together a sense of efficiency and proximity that is distinctive to the new brand. LATAM, short for LATin AMerica, is a good name that not only stands for the part of the continent the airline serves but also sounds like both airlines it’s replacing so, even through confusion, people might end up associating it with either of them. The name also pays off with the new icon, an abstract representation of South America. 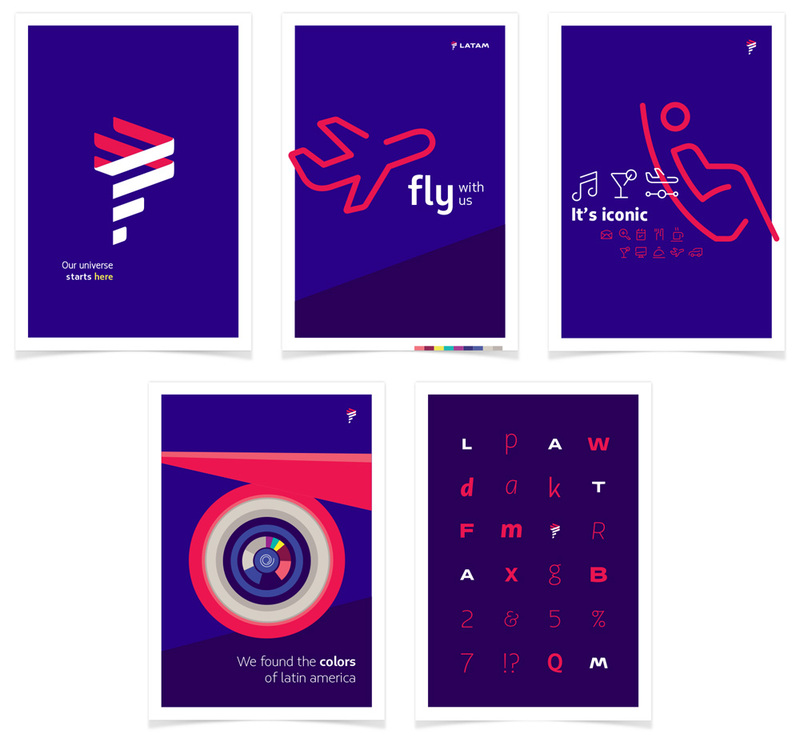 It might be one of the best airline logos I’ve seen recently and I would go as far as saying it’s one of the best corporate identity logos I’ve seen all year. It’s reminiscent of the logo work Interbrand and Landor were doing in the 1990s: simple, smart, with one strong idea well executed. The abstraction of South America is not obvious at first but giving it a second or two pays off. It’s a dynamic and active icon through the angled lines and it has dimension without resorting to shading and chrome effects. I’m not as ebullient about the wordmark but it pairs very well with the icon by matching the corner styles. Maybe they got a little carried away with the extended structure but in terms of trying to make it distinctive it succeeds. New name and logo introduction. There aren’t any actual applications yet and I wish they hadn’t shared the “posters” above as they make little sense and take away some of the seriousness of the logo. The icons, which also appear in the video, have no clear relation to the logo and feel like they are from a separate project. Even the video itself seems too cute and playful for a large airline. For now, the logo is a great start to this “new” airline and I’m optimistic that the livery, uniforms, and actual applications will rise to match that effort and result. Thanks to Tomás de la Maza for the tip.